Australian summers are hot and dry, and while we are not in a drought cycle like the Eastern States, it does get very warm here in York. 45º C is not unheard of. The hot weather and the lack of rain means that the Avon River largely dries up with the exception of a few deep pools, and so I often go walking along the dry river bed with Frida my faithful canine companion as it allows me to view quite a variety of wildlife that congregates around the pools. Female Western Whistler, sometimes called the Western Golden Whistler, (Pachycephala occidentalis). York, Western Australia. Olympus OMD EM10 with Olympus M.Zuiko Digital ED 75-300mm f/4.8-6.7 II lens. Exposure: 1/1000sec, f7.1 at ISO 500. A Southern Scrub Robin, Drymodes brunneopygia, achives vertical take off. The Nyoongar name is Djibot. York, Western Australia. Olympus OMD EM10 with Olympus M.Zuiko Digital ED 75-300mm f/4.8-6.7 II lens. Exposure: 1/1000 sec, f7.1 at ISO 500. White-faced Heron (Egretta novaehollandiae). York, Western Australia. Panasonic Lumix G85 with LEICA DG 100-400/F4.0-6.3 lens. Exposure: 1/1000 sec, f6.3 at ISO 250. Brown Honeyeater, Lichmera indistincta.The Nyoongar name is Djindjoko. York, Western Australia. Panasonic Lumix G85 with Panasonic LEICA DG 100-400/F4.0-6.3 lens. Exposure: 1/1000 sec, f6.3 at ISO 3200. Sacred Kingfisher, Todiramphus sanctus. Known by the Nyoongar as Koonyenok. Avon River, York, Western Australia. Canon EOS 550d with a Sigma 150-600mm f/5-6.3 DG OS HSM Contemporary lens. Exposure: 1/1000 sec, f6.3 at ISO 250. It’s not just birds we see, there are small fish in the ponds (difficult to photograph) and masses of different insects like this damselfly below. Blue ringtail damselfly (Austrolestes annulosus,) at rest on the Avon River, York, Western Australia. Canon EOS 550d with a Sigma 150-600mm f/5-6.3 DG OS HSM Contemporary lens. Exposure: 1/1000 sec, f6.3 at ISO 1250. Frida usually takes my photographic hijacking of her morning walks with good grace. She usually waits for me either in some convenient shade or as shown below standing in some water. She’s not as daft as she looks! Frida waiting patiently in the cool of a water pool. The other morning we were quite surprised to have a fox pop out of the long grass on the river bank and on to river bed. Initially it took off, but when it saw that Frida wasn’t in hot pursuit slowed down and turned back. The fox and Frida then played a mad game of chase up and down taking it in turns to be the chaser and the the chasee. Quite delightful to watch. It was like the canine equivalent of Kevin Costner’s film Dances With Wolves. Unfortunately by this time the battery in the camera had run flat so I was unable to take any photos of this rather special occurrence. Although this being a predominantly farming community most round here would not regard it as such as they belong to the “only good fox is a dead fox” brigade. A couple of days later we went back to see if the event could be repeated and I had a pocket full of batteries to ensure that I got some photos. We did find the fox in the same location but this time both it and Frida were indifferent to each other and the fox disappeared into the undergrowth on the opposite bank. Again I stuffed up the photography and all I got was the slightly blurred image below. Perhaps we’ll try again. 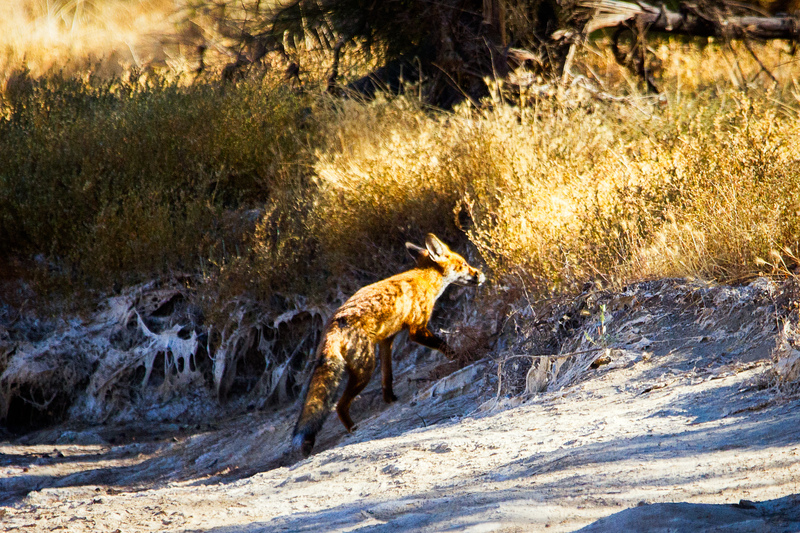 Red fox (Vulpes vulpes) on the Avon River river bed. York, Western Australia. The soundtrack for summer in the Western Australian bush is provided by Broome based band the Pigram Brothers and their track Dry River Bed provided the title and inspiration for this blog entry.